*The altarpiece within the main sanctuary, completed by Giulio Romano, depicts the Holy Family. *The third chapel on the right side of the nave is dedicated to the Holy Family. *This small church is located near the Trevi Fountain. *Over the main altar is a large painting of the Holy Family. *The painting in the second chapel on the left side of the nave depicts the Holy Family. It was completed by Giacinto Brandi in 1660. *The second chapel on the left side of the nave is dedicated to the Holy Family. *The second chapel on the left side of the nave is dedicated to the Epiphany. The painting within this chapel depicts the Magi adoring the Christ child. *The large painting in the right transept depicts the Three Kings giving gifts to the Christ Child. *The fifth chapel on the right side of the nave contains three paintings from the 16th century that depict the Adoration of the Magi, the Nativity, and the Circumcision. *The first chapel on the left side of the nave contains a large mosaic of the Baptism of the Lord. The original painting that this mosaic replaced hangs within the Roman church Santa Maria degli Angeli. *Within the left transept is a large painting of the Baptism of the Lord. *The third chapel on the right side of the nave is dedicated to the Baptism of the Lord. *A large painting of the Last Supper is placed within the first chapel on the left side of the nave. *Within the fourth chapel on the right side of the nave is a work entitled The Flagellation of Jesus. This painting was completed by Louis Vincent Leon Pallière in 1817. *Within the fourth chapel on the left side of the nave is a powerful image of The Deposition of Christ by Francesco Salviati. *Within the second chapel on the right side of the nave is marble sculpture of The Deposition of Christ by Pietro Tenerani. *Within the second chapel on the left side of the nave is a painting of The Deposition of Christ by Daniele da Volterra. *The chapel to the left of the main sanctuary is dedicated to the Passion of Christ. *Within the first chapel on the right side of the nave is a painting depicting the scourging of Christ by Sebastiano del Piombo. *The second chapel on the right side of the nave is dedicated to the Passion of Christ. *Within the chapel on the left side of the nave is a painting of the Resurrection. It was completed by Jean François de Troy in 1740. *In the Cerasi Chapel, to the left of the main altar are two works by Caravaggio entitled the Crucifixion of St Peter and the Conversion of St Paul. These two works are on the side walls of the chapel and face each other. In between these two works is Annibale Carracci’s, Assumption. 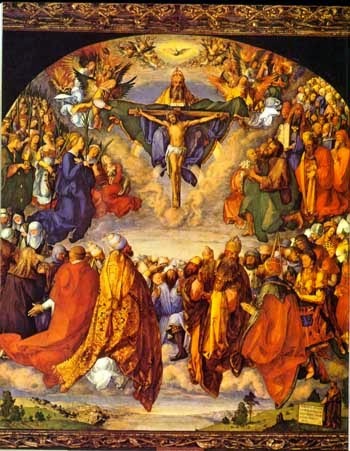 It is said that the positioning of these paintings show both Peter and Paul acknowledging the grace of the Resurrection as it is being realized through the Assumption of the Blessed Virgin Mary. *On the right side of the nave, near the entrance and above the large statue of St Thaddaeus, is a relief of the Resurrection of Christ. *The first chapel on the right side of the nave was originally dedicated to the Resurrection. Remnants from this previous dedication still remain within the chapel. This includes a number of frescoes completed by Baldassare Croce and Cesare Nebbia which depict various post-resurrection events from the Gospels. *The fourth chapel on the right side of the nave is dedicated to St Faustina and Divine Mercy. *To the left of the main altar is a painting of the Ascension. *A painting in the sixth chapel on the left side of the nave depicts the Ascension. It was completed by Girolamo Muziano in the 16th century. *The third chapel on the right side of the nave is dedicated to the Ascension. *This ancient temple was converted into a Christian church in the year 609. It now honors the Blessed Virgin Mary and the Christian martyrs. *At the end of the Mass on Pentecost thousands of rose petals are dropped from the opening in the dome onto the people below. *This church is near the Vatican. It is dedicated to the Holy Spirit. *Both the large painting in the main sanctuary and a smaller painting in the first chapel on the right side of the nave depict the Pentecost. *The fourth chapel on the right side of the nave is dedicated to the Holy Spirit. *The third chapel on the right side of the nave is dedicated to the Holy Spirit. *This church is located near Piazza Farnese. It is dedicated to the Most Holy Trinity. *This church is at the top of the Spanish Steps. It is dedicated to the Most Holy Trinity. *Within the various side chapels in this church are many distinguished pieces of religious art. *This church is near the Spanish Steps. It is dedicated to the Most Holy Trinity. *The large painting in the main sanctuary depicts the Holy Trinity. It was completed by Francesco Grandi in 1862. *The third chapel on the left side of the nave is dedicated to the Holy Trinity. *This church is near Circo Massimo. It has Perpetual Adoration of the Blessed Sacrament 24 hours a day in a chapel to the left of the main sanctuary. *A relic of St Peter Julian Eymard (d 1868) is placed within a statue of his likeness that rests within an urn on the right side of the nave. *St Peter Julian Eymard is often called the Apostle of the Eucharist since he is the founder of the Congregation of the Most Blessed Sacrament. This church is run by this community; therefore, Eucharistic devotion is strongly promoted including frequent adoration of the Blessed Sacrament. *A table located above the altar where the Blessed Sacrament is reserved on the left side of the nave is claimed to be the table upon which Jesus and the apostles celebrated the Last Supper. It is placed directly behind a bronze relief depicting the Last Supper. *Within the Aldobrandini Chapel is a painting of the Institution of the Eucharist. This is the sixth chapel on the right side of the nave. The First Blessed Sacrament Confraternity to be approved by the Holy See was established in this chapel. *The beautiful chapel to the right of the main sanctuary is dedicated to the Sacred Heart of Jesus. *This church is near the Termini Train Station. It is dedicated to the Sacred Heart of Jesus. *The church was built by St John Bosco and finished in 1887. *This church is at Piazza Navona. It is dedicated to Our Lady of the Sacred Heart. *The third chapel on the right side of the nave is dedicated to the Sacred Heart of Jesus. *The first chapel on the left side of the nave is dedicated to the Sacred Heart of Jesus. *The fourth chapel on the left side of the nave is dedicated to the Sacred Heart of Jesus. *This church is next to the Tiber River and is north of Castel Sant’Angelo. It is dedicated to the Sacred Heart of Jesus. *The chapel to the left of the main altar is dedicated to the Immaculate Heart of The Blessed Virgin Mary. *The grill used to burn St Lawrence (d. 258) is preserved under the altar in the first chapel on the right side of the nave. *This church is just west of the Pantheon. *The third chapel on the left side of the nave is dedicated to the Immaculate Heart of The Blessed Virgin Mary. *This church is located next to the Roman Forum. *The mosaic within the apse depicts Christ at his Second Coming. When it was created in the 6th century it was intended to be viewed from a greater distance. In the 17th century, however, the church was restored and the floor raised about 25 feet to its present location. Thus the mosaic is now much closer than it was intended. *The large painting in the main sanctuary depicts Christ the King.